It’s no secret that Facebook is where people see your images, where clients interact with your brand, get tagged and share the love. Make sure your images look the best they can with this FREE script for Photoshop. FB Photo Optimizer will batch re-size all of your best images to the perfect size for Facebook and allow you to run actions before they save to a folder. You can also set the description of the photos as they will appear on Facebook (great when delivering Facebook ready images to clients!) Simple. Free. Beautiful. 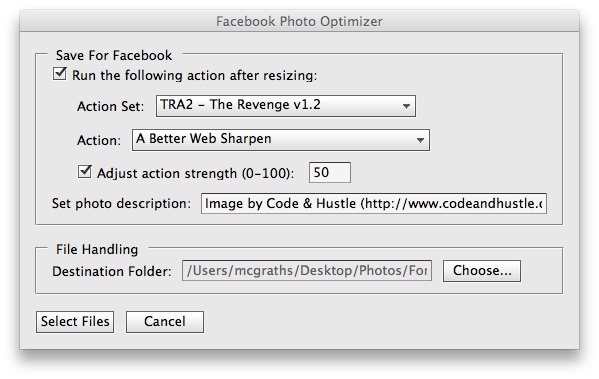 Go ahead and grab a free copy of Facebook Photo Optimizer now!